...created by Takasago’s Francis Kurkdjian, opens on notes of apricot and orange blossom, leading to a heart of jasmine and plum. The base is composed of heliotrope and woods. Spanish pop star Alejandro Sanz has launched his debut fragrances, Siete Alejandro Sanz Man and Siete Alejandro Sanz Woman. The fragrances focus on seven main notes each (siete is the Spanish word for seven). Siete Alejandro Sanz Woman is a fresh feminine scent with notes of ginger, palisander wood, jasmine, violet leaves, musk, amber and exotic woods. 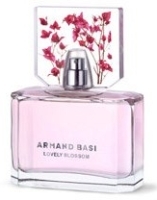 Normally a scent called Lovely Blossom would not be something I'd be interested in, but can't resist trying something new by Kurkdjian and the notes actually sound like they have potential. Also normally avoid celebrity scents, but have to admit I like Alejandro Sanz a lot and the woman's scent sounds intriguing. Feeling awkwardly Pollyannaish this morning. I think the AB comes to the US early next year — and agree, if it is FK it can't be bad, right? The AS, not sure it will get here at all — and sorry to say I'd never heard of him.